A whole lot more people needs to join him. What an ungreatful nation! 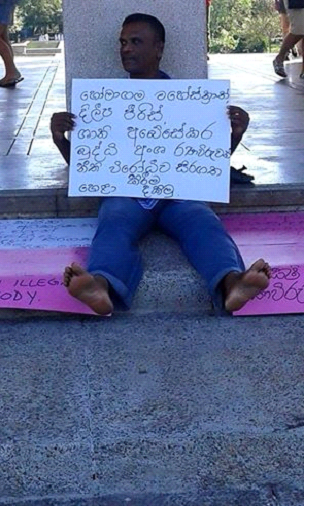 Where are the voices of anger, where is the sense of justice and where have all Sri Lankans gone ? We have become a shameless, voiceless, pathetic nation; and Sri Lankans will get what they deserve. Who will ever give their lives to save this country, ever again? Today, war heros are zeros and the traitors are voted in. Vijayaba Kollaya Part 2 will dawn upon us very soon. Thank you Maj Gen Ajith Prasanna (Attorney at law) for staging this protest. We are proud of you. People like you are needed in parliament instead of reconciliation scoundrels. Now it is well known in legal circles that the Homagama magistrate is very ‘strict’ and selective on bail and jail conditions (to say the very least). It reflects badly on the entire judiciary. 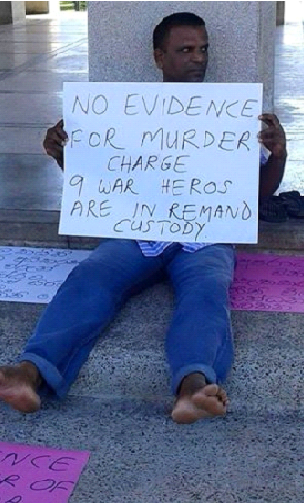 The sight of this soldier sitting barefoot on the pavement with his Appeal for Justice for the 9 War Heroes in Remand Custody is a Disgrace and a Shame to the Democratic Republic of Sri Lanka, GoSL in particular. Is the entire country of 21 Million people cowering in FEAR of the RW/CBK govt. plus -ms, which came into power through stealth using foreign plans, with the IC in tow ? War Crimes of a serious nature did not happen. Our own Army Tribunals can deal with Army misdemeanors, we do not need interntaional interference in this. In the first place, Sri Lanka has come to this sorry state of affairs because of colonisers. Set FREE all those accused of War Crimes !! They deserve the status of “LANKA HEROES” ! If this happened in another country, head of state would tender his resignation. May the gods protect our war heroes. Let the people gather round them in these demonstrations. Homagama magistrate is a real neechaya. He did not say a word against Ganasara Thero when he spoke and then go ahead and order arrest of him. Why couldn’t him answer him and give arrest orders on the spot ? A disgrace to mankind.